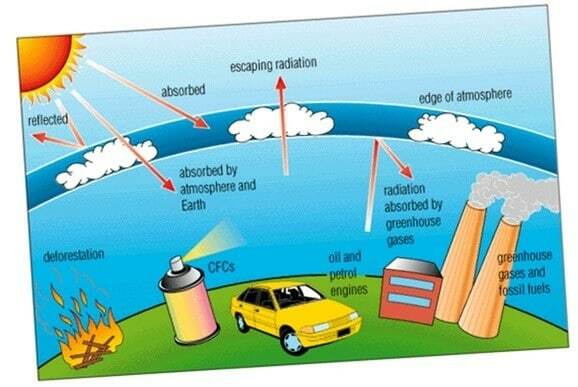 The Earth’s atmosphere comprises different gases that cover the planet like a blanket. It’s in many layers. The part of the atmosphere that we are able to see from the land which has the clouds, the rainbow, birds and airplanes, kites is actually only a thin layer when compared to the full size of the Earth. The Earth is huge spherical ball slightly tilted on its axis, third in position in the Solar System. The radius of the Earth is roughly about 6400 kms, but all our airplanes can go as high as 16 kms only which is hardly anything when compared to the whole of the Earth. As one moves away from the surface of the Earth, the pressure of the air gradually decreases. There is no line in the atmosphere which shows where the space begins, it does not happen suddenly, it’s gradual. When we go up a mountain, it gets colder. The higher we are above the Earth’s surface, the colder it gets. But this is not true for the whole of the Earth’s atmosphere. There are certain portions of the atmosphere where temperature stays the same, and other portions where it even rises as we go up. The Earth’s atmosphere has five main layers. From the lower layer to the higher layers, they are: the troposphere, stratosphere, mesosphere, thermosphere, and exosphere. 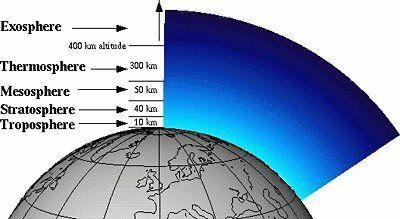 The troposphere is the layer of atmosphere that starts from the surface of the Earth to a height of 12kms. This mostly has the clouds, air planes, and air currents in the Earth’s atmosphere. The exact height of the troposphere depends on where you are on the Earth and the exact weather conditions at that moment. It is the heaviest of the layers. It contains around 80% of the mass of the atmosphere. The stratosphere is just above the troposphere. It starts from 12kms above the Earth’s surface to around 48-54kms above the Earth’s surface. Here there are unusually high clouds called nacreous clouds, the ozone layer, and even a few aircraft, usually the jets. This is the layer which contains the ozone layer. The temperature in the stratosphere gets warmer as we go up due to the absorption of ultraviolet radiation in the ozone layer. The mesosphere is above the stratosphere and reaches from around 48-55 kms above the ground up to 80-85 kms. It becomes quite cold here and that the little drops of water vapor found here sublimates directly into clouds. Cloud formation does not happen anywhere after this layer. 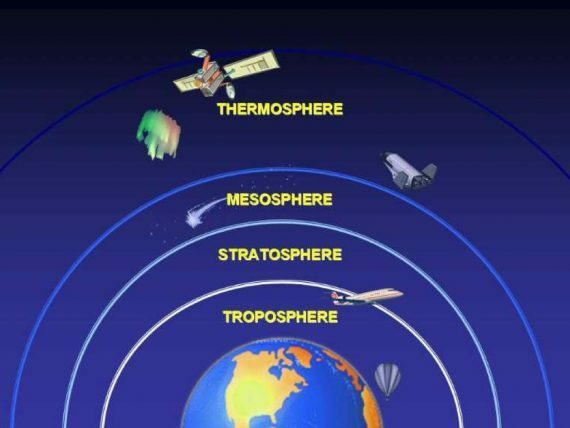 The thermosphere is the next layer also called the ionosphere because of the presence of ions in this layer. It starts from 80-85 kms up until 490kms to 900kms. The International Space Station orbits in this layer. This is where we find the auroras that people see from Earth near the North and South poles. The size of the thermosphere depends on how hot the Sun is at a time. Temperature here increases drastically, but there is no proper way to calculate this; because of the presence of very few molecules in this layer and also that they’re moving rapidly. There are no clouds in this layer. Finally, the exosphere is the uppermost and the last layer of the atmosphere. This is where atoms and molecules escape Earth’s gravity into space. The Earth’s atmosphere is mostly nitrogen: 78% to be exact, 21% of the atmosphere is the oxygen that we breathe, 0.9% argon, and 0.04% carbon dioxide. Even though there is so little carbon dioxide in the atmosphere it is very powerful and most of the climate change is happening because of changes in a tiny percentage of the atmosphere but it affects a lot. The atmosphere also has water vapor which is sometimes as high as 5% of the atmosphere in the wettest places. Air is actually a mixture of various gases. All animals and plant life are dependent on the air all around. Nature maintains a good balance of the gases present in the atmosphere apart from the mess humans have made with respect to global warming due to the pollution emitted from various factories vehicles and nuclear testings. Gases like water vapor, carbon dioxide and methane are green house gases which are present in the small amounts. Like a thick blanket that covers Earth, they are especially good at trapping heat. And because their concentrations are increasing due to human activity, more heat than ever is being trapped underneath these gases and the Earth overall is warming. 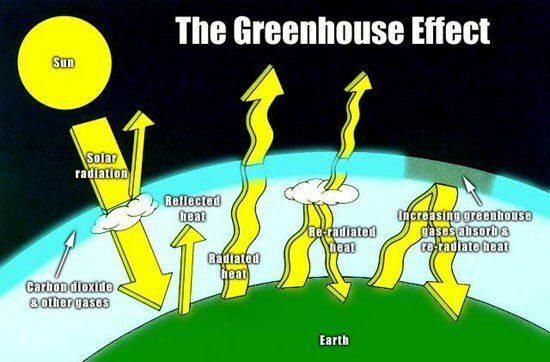 This is termed as the Greenhouse Effect. Ozone is a small but very important component of the atmosphere. Ozone is made up of three oxygen molecules and is what protects us from harmful UV radiation of the sun. Ozone absorbs this radiation, blocking most of it from reaching us on the ground. It acts as a filter in the atmosphere. This is the reason why there is such a concern about the thinning of the ozone layer and its depletion. If it is unable to filter out harmful rays, then more UV radiation reaches us. This is a major issue because UV radiation makes us very sick. It causes skin cancer(leucoderma), and harms other plants and animals and sometimes dangers of vision impairment. ………… contains most of the clouds, weather, air planes, and air currents in the Earth’s atmosphere. The is the coldest layer in the atmosphere is…………….. The …………… is the uppermost layer of the atmosphere. This is where atoms and molecules escape Earth’s gravity into space.